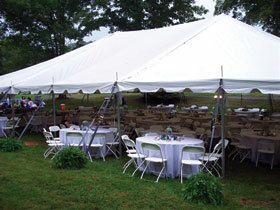 I just got off the phone with Ann from Saco Hill Party Rentals. I am all set and booked for Agust 27th 2011. I called 10 different companies! Saco Hill Rental is 50 miles away from Wellsboro. Ann has a very small delivery fee $35. For my 30x45 tent 14 60" round plus 5 long tables and 100 chairs my total for Thursday delivery- Sunday pick up is $406.50 Not too bad hu? Ann was very sweet! She is a single mom who runs the rental biz by herself. She told me she fought to keep it and has owned it for the past 10 years. Shop around, ask for prices, don't be afraid to mention a competitor price that is lower. Heck, try a different area it may be cheaper!